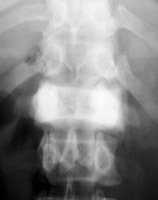 A uniformly white vertebra with no abnormality of its contour or adjacent disks. The vertebra stands out against the adjacent normal, or darker, vertebral bodies. While the list of possible etiologies of ivory vertebrae is extensive, the most common causes of ivory vertebrae are typically metastatic disease, and Pagets. A-B. Metastatic breast cancer. C-D. Paget's disease. Ochsner HC, Moser RH: Ivory vertebra. AJR Am J Roentgenol 1933; 29:635-637.